Distance 6 km one way. Description Separate shared path/cycleway, mostly flat, easy riding. Start/finish Start Howard Street roundabout near the racecourse. Highlights Great commuter route between Sawtell/Toormina and Coffs Harbour, passing the education campus, school, and sports fields. Mainly flat, just one small hill south of the Coffs Harbour Education Campus. This is a shared path, so watch for pedestrians and runners. Keep to the left. Caution is required when crossing roads. Ride single file on narrow bridges. Take care on uneven sections of pavement. A popular on-road detour for extra distance and varied scenery is via Christmas Bells Road, Aviation Drive and Airport Drive. Description On-road routes to Sawtell. Sawtell Road has moderate traffic and some hills. Take the back streets of Toormina for a quieter option. 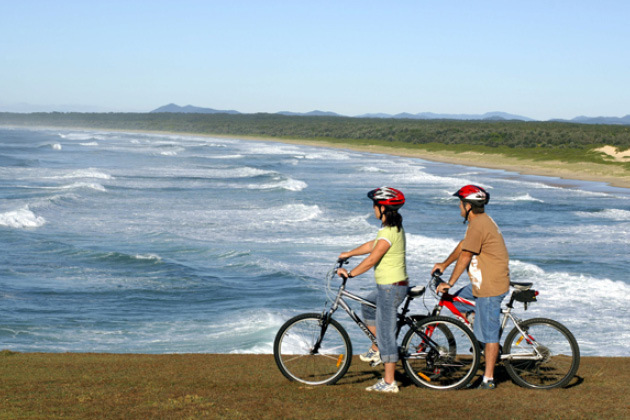 Highlights The heritage village of Sawtell is a popular destination for cyclists. Take the direct route along Sawtell route if you are comfortable riding with some traffic. Alternative route – take Wirrabilla Drive, Lalaguli Drive and Werambie Street. Use the pathway at the end of Werambie Street to cut through to Hulberts Road. Cross the railway, then take Sixteenth Avenue, past Sawtell Railway Station, then ride along Boronia Street to First Avenue. Caution required crossing Sawtell Road and the level crossing. Take a detour along Minorie Drive to check out the Velodrome and Criterion Track. Turn left into Boronia Street. The detour to Sawtell Headland is a must for fantastic ocean and creek views. Grab a coffee or a meal at one of the many cafes in First Avenue or at the Surf Club. Distance 9 km one way. Description Alternative route from Coffs to Pine Creek Way, using the shared path alongside the Pacific Highway. Highlights Mostly off-road, shared path. A great facility for cyclists. Take the Hogbin Drive cycleway to CHEC (Education Campus) roundabout. Turn right into Stadium Drive. There are bike lanes, but these are inconsistent. Caution required. Join the off-road shared path at the south eastern corner of the Pacific Highway roundabout. Caution required when crossing Sawtell Road, Bruce King Drive, and on the roundabout at Lyons Road if you continue on to Pine Creek Way. Distance 5 km one way. Description Quickest route from Sawtell to the Pacific Highway. Moderate traffic and some hills. Start/finish First Avenue, Sawtell to the start of Pine Creek Way. Highlights Some great views over Bonville Creek. This route suits more experienced cyclists. Take Bayldon Road past the golf course. Another option is to use Toormina Road. Description On-road. Sealed. Former Pacific Highway. Light to moderate traffic. Start/finish Lyons Road Roundabout to Perrys Road, Repton. Highlights A pleasant ride. This secondary road provides a perfect link between Coffs and the Urunga/Bellingen region.